This is a delicious Italian meatballs recipe that friends and family will love. It is a little different than the meatballs my mother used to make, but quite delicious. Although you certainly don’t find this in most meatball recipes, I like the addition here of a bit of tomato paste. It gives the meatballs extra zip. In a large skillet, heat oil over medium heat. Add onion and saute for 5 minutes. Add garlic and stir. Remove from heat. In a large bowl combine the egg, parmesan cheese, ground beef, tomato sauce and parsley. Add the onion garlic mixture and mix until the ingredients are blended. Roll the mixture into small balls, about 1 1/2" in diameter. Fry in a bit of oil or, if you prefer to bake them, place them on a baking sheet and bake in preheated 350ºF (180ºC) oven for 20 minutes or until cooked through. Add them to Italian tomato sauce and heat through to serve. Meatballs can be fried or baked. Baking meat balls results in a lower fat content, but I prefer the nice brown crust on the fried version. Suit your own taste. They will both taste great. You can also add 1 celery rib, finely diced to the meat mixture. A real Italian meatballs recipe doesn’t use celery, but some think it’s a nice addition. If you do add celery, saute it with the onion. Italians often use a mixture of ground beef, pork and veal. It makes the meatballs very flavorful. Of course what would an Italian recipe be without garlic? Garlic is so good for you that I try to include it in as many recipes as I can. Meatballs don’t have to have a lot of seasonings in the recipe to taste delicious. Just add a bit of garlic, some Parmesan cheese and either oregano or basil (this recipe uses oregano). Once the meat balls are cooked you can add them to any Italian pasta sauce recipe. They can even be partly cooked and added to the sauce to simmer and finish cooking in the sauce. That keeps the meatballs soft and adds flavor to the sauce. Meatballs are a great diabetic recipe. The meatballs themselves are very low carb. It’s the pasta that is higher in carbs. 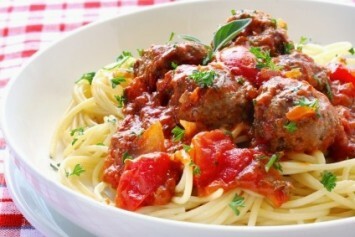 If you are diabetic, eat more meatballs and just a bit of pasta, with lots of salad or other vegetables on the side. If you like this recipe, I’d love you to Pin it to Pinterest, Tweet about it, Like it on Facebook and leave a comment and your own meatball or other recipes below. You will find several Italian sauce recipes here. Look here for a chunky tomato sauce that would work perfectly with our Italian meatballs recipe.